Having a desk is a great! It’s a designated space to develop ideas and keep organised, or at least it starts out that way… What began as a lovely place to get creative can quickly turn into a sea of clutter making crafting a frustrating experience. No more! 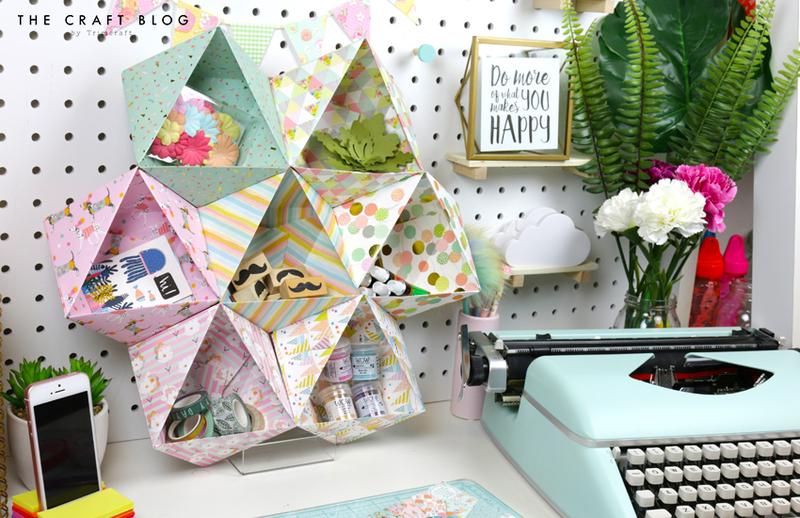 Follow this easy step-by-step to create an amazing geometric origami desk organiser, perfect for keeping all those knick-knacks under control so you can claim back your desk. 1. Start with 3 sheets of 8” x 8” Let’s Celebrate paper in the same design. 2. Fold in half diagonally to create a triangle shape. Make sure the desired design is facing outwards. 3. Take the 2 furthest corners and fold them down to meet the other corner. 4. Unfold these to the large triangle shape and bring the last corner up to the centre point created by the last step. TIP: To make sure all the folds are crisp, use a bone folder to apply more pressure to each fold. 5. Repeat steps 1 – 4 on the remaining 2 sheets of paper. 6. Line all 3 piece up with the longest sides facing down. 7. Slot the two outer pieces into the middle piece to create a geometric origami desk organiser. You can stop here for a lovely organiser great for holding rubber bands, paper clips and other desk essentials or continue reading to find out how to turn this simple shape into a wall organiser! 8. Repeat steps 1-7 until you have 7 origami desk organisers. 9. Arrange and stick these onto a 12” x 12” piece of cardboard. 10. All that’s left to do it hang it up and voilà, you have your very own geometric origami wall organiser! You can customise this any way you like! Add more or less organisers or change up the papers to better suit your aesthetic and lifestyle! We love the bright pastel colours so much and the small paper plant adds a touch of botanical bliss. Will you be creating your own geometric origami organisers? We’d love to see if you give this a go, so don’t forget to upload your versions to the Inspiration area and #Trimcraft when sharing to social media! Most importantly, stay inspired and keep crafting!